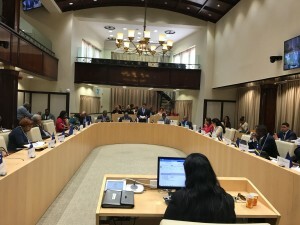 WILLEMSTAD - Again in parliament, there are talks about abolishing the one guilder contribution to be paid by patients for prescription drugs. The parliament wants to get rid of that and that is why they adopted a motion stating this. Now it’s up to the government to comply. The pharmacists were never in favor of the introduction of the rule that had to create a damping effect on the purchase of medicines, says Shaheen Elhage chairman of the association of pharmacists in Curaçao. That dampening, ie expenditure reduction, did indeed take place, says Elhage. Yet he does not answer the question of whether it is a good thing if the billing of those guilders disappears. He believes that the starting point was wrong. It is not finances that should come first, but the care itself and all parties involved should sit down and negotiate with each other. For each of them, the value should be determined and then what the compensation should be.